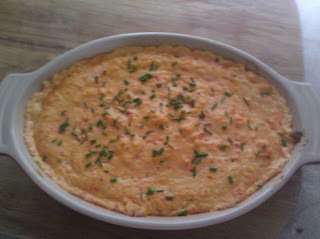 A few years ago, I was planning a party, and searching online for a unique dip recipe. I found one on allrecipes.com titled "Mary's Roasted Red Pepper Dip" and decided to give it a try. It came out amazing and it's been a staple at my parties ever since. The recipe has only a few ingredients (roasted peppers, cream cheese, dijon, monterey jack, and a few others) and is very easy to make. I've tried it using jarred roasted peppers vs. roasting them myself, and you can't tell the difference. I've pureed the peppers in a food processor with the other ingredients, to give the dip a smooth texture, and also tried it just chopping the peppers, which made it more chunky. Either way was delicious. It's great straight from the oven, bubbly and browned, or at room temperature. I also had a friend who used the leftover dip as a pasta sauce which also turned out great. Give it a try at your next shindig.